Every year, The CW television network introduces new TV series, which are either cancelled or renewed by the season’s end. Likewise, among existing shows which were initially renewed and returned for another installment, there are always some under-performers that wind up as the television vulture’s TV dinner du jour. Although everyone understands the Nielsen ratings usually play a big role in TV cancellations and renewals, most fans do not get to participate in that system. Since so many viewers’ opinions do not factor into the littlest network’s programming decisions, we are offering you the chance to submit your own CW TV show ratings to us, instead. 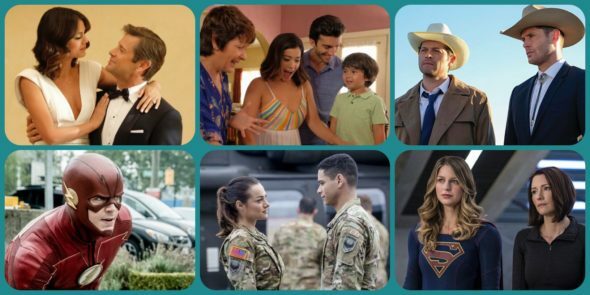 You can vote on the following CW TV series that have premiered (so far) during the 2017-17 television season: The 100, Arrow, Black Lightning, Burden of Truth, Crazy Ex-Girlfriend, DC’s Legends of Tomorrow, Dynasty, The Flash, iZombie, Jane the Virgin, Life Sentence, Masters of Illusion,My Last Days. The Originals, The Outpost, Penn & Teller: Fool Us, Riverdale, Supergirl, Supernatural, Valor, and Whose Line Is It Anyway?. What do you think? Which CW TV series do you rate as wonderful, terrible, or somewhere between? If it were left up to you, which CW TV shows would be cancelled or renewed for another season? Don’t forget to vote, and please share your thoughts, below. More about: Arrow, Black Lightning, Burden of Truth, Crazy Ex-Girlfriend, DC's Legends of Tomorrow, Dynasty (1981), iZombie, Jane the Virgin, Life Sentence, Masters of Illusion, My Last Days, Penn & Teller: Fool Us, Riverdale, Supergirl, Supernatural, The 100, The Flash (2014), The Originals, The Outpost, Valor, Whose Line Is It Anyway?